We really appreciate your comments and feedback. 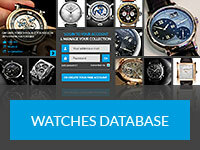 We invite all professionals and anyone with a passion for fine watches to contact us and share your thoughts. You can contact us by email or post a comment on our Facebook page. RSS Feed – can be used from browser or for displaying post titles on your website. RSS via email – after subscribing you will receive each new post via email. Twitter – if you’re on twitter you can follow us. New posts will be on Twitter as well. FaceBook – if you’re on facebook you can like us. New posts will be on Facebook as well. Google+ – if you’re on Google+ you can follow us. New posts will be on Google+ as well. You can also follow our Pinterest, StumbleUpon, YouTube, Tumblr and Instagram account. We would love to hear from anyone wishing to contribute to DreamChrono. Whether you are looking to write the odd review or article or maybe just become a member of our team, we would be delighted to hear from you. We are passionate collectors and as such we feel it is important that others should be a part of this exciting project. To learn more or see how you can be part of the DreamChrono writing team click here to contact us by e-mail. DreamChrono do not share your contact details with any other organization.